As the threat of global warfare diminishes and the cold war slowly fades into history, more government and law enforcement resources are being re-allocated to fight the "enemy within." And a new class of weapons is being developed to fight "bloodless" battles, fry computer circuitry and control human minds en masse. ParaScope presents David G. Guyatt's overview of the history of electromagnetic weapons, prepared for the Red Cross (ICRC) symposium "The Medical Profession and the Effects of Weapons." Get the scoop on this ominous trend towards a "psycho-civilized society," from early Japanese attempts to manufacture a "death ray" to current law enforcement expenditures on "less than lethal" EM arsenals. Reposted with permission of the author. Part 1 Toward a Psycho-Civilized Society - The background to the development of anti-personnel electromagnetic weapons can be traced by to the early-middle 1940's and possibly earlier. The earliest extant reference, to my knowledge, was contained in the U.S. Strategic Bombing Survey (Pacific Survey, Military Analysis Division, Volume 63) which reviewed Japanese research and development efforts on a "Death Ray." Whilst not reaching the stage of practical application, research was considered sufficiently promising to warrant the expenditure of Yen 2 million during the years 1940-1945. Summarizing the Japanese efforts, allied scientists concluded that a ray apparatus might be developed that could kill unshielded human beings at a distance of 5 to 10 miles. Studies demonstrated that, for example, automobile engines could be stopped by tuned waves as early as 1943. (1) It is therefore reasonable to suppose that this technique has been available for a great many years. Research on living organisms (mice and ground hogs) revealed that waves from 2 meters to 60 centimeters in length caused hemorrhage of lungs, whereas waves shorter than two meters destroyed brain cells. However, experiments in behavior modification and mind manipulation have a much more grisly past. Nazi doctors at the Dachau concentration camp conducted involuntary experiments with hypnosis and narco-hypnosis, using the drug mescaline on inmates. Additional research was conducted at Aushwitz, using a range of chemicals including various barbiturates and morphine derivatives. Many of these experiments proved fatal. Following the conclusion of the war, the U.S. Naval Technical Mission was tasked with obtaining pertinent industrial and scientific material that had been produced by the Third Reich and which may be of benefit to U.S. interests. Following a lengthy report, the Navy instigated Project CHATTER in 1947. Many of the Nazi scientists and medical doctors who conducted hideous experiments were later recruited by the U.S. Army and worked out of Heidelberg prior to being secretly relocated to the United States under the Project PAPERCLIP program. Under the leadership of Dr. Hubertus Strughold, 34 ex-Nazi scientists accepted "Paperclip" contracts, authorized by the Joint Chiefs of Staff, and were put to work at Randolph Air Force Base, San Antonio, Texas. By 1953 the CIA, U.S. Navy and the U.S. Army Chemical Corps were conducting their own narco-hypnosis programs on unwilling victims that included prisoners, mental patients, foreigners, ethic minorities and those classified as sexual deviants (2). It was not until the middle or late 1970's that the American public became aware of a series of hitherto secret programs that had been conducted over the preceding two decades by the military and intelligence community. (3) Primarily focusing on narco-hypnosis, these extensive covert programs bore the project titles MKULTRA, MKDELTA, MKNAOMI, MKSEARCH (MK being understood to stand for Mind Kontrol), BLUEBIRD, ARTICHOKE and CHATTER. The principal aim of these and associated programs was the development of a reliable "programmable" assassin. Secondary aims were the development of a method of citizen control (4). Particularly relevant was Dr. Jose Delgado's secret work directed towards the creation of a "psycho-civilized" society by use of a "stimoceiver." (5) Delgado's work was seminal, and his experiments on humans and animals demonstrated that electronic stimulation can excite extreme emotions including rage, lust and fatigue. In his paper "Intracerebral Radio Stimulation and recording in Completely Free Patients," Delgado observed that: "Radio Stimulation on different points in the amygdala and hippocampus in the four patients produced a variety of effects, including pleasant sensations, elation, deep thoughtful concentration, odd feelings, super relaxation (an essential precursor for deep hypnosis), colored visions, and other responses." With regard to the "colored visions" citation, it is reasonable to conclude he was referring to hallucinations -- an effect that a number of so-called "victims" allude to. (7) As far back as 1969, Delgado predicted the day would soon arrive when a computer would be able to establish two-way radio communication with the brain -- an event that first occurred in 1974. Lawrence Pinneo, a neurophysiologist and electronic engineer working for Stanford Research Institute (a leading military contractor), "developed a computer system capable of reading a person's mind. It correlated brain waves on an electroencephalograph with specific commands. Twenty years ago the computer responded with a dot on a TV screen. Nowadays it could be the input to a stimulator (ESB) in advanced stages using radio frequencies" (8). In any event, narco-hypnosis was found, it is claimed, to be less than reliable, although some writers and observers dispute this. (9) Additional studies, conducted by Dr. Ewen Cameron and funded by the CIA, were directed towards erasing memory and imposing new personalities on unwilling patients. Cameron discovered that electroshock treatment caused amnesia. He set about a program that he called "de-patterning" which had the effect of erasing the memory of selected patients. Further work revealed that subjects could be transformed into a virtual blank machine (Tabula Rasa) and then be re-programmed with a technique which he termed "psychic driving." Such was the bitter public outrage, once his work was revealed (as a result of FOIA searches), that Cameron was forced to retire in disgrace. Also of interest is Dr. John C. Lilly (10), who was asked by the Director of the National Institute of Mental Health to brief the CIA, FBI, NSA and military intelligence services on his work using electrodes to stimulate, directly, the pleasure and pain centers of the brain. Lilly said that he refused the request. However, as stated in his book, he continued to do "useful" work for the national security apparatus. In terms of timing this is interesting, for these events took place in 1953. Scientist Eldon Byrd, who worked for the Naval Surface Weapons Office, was commissioned in 1981 to develop electromagnetic devices for purposes including riot control, clandestine operations and hostage removal (11). From 1965 through to 1970, Defense Advanced Projects Research Agency (DARPA), with up to 70-80% funding provided by the military, set in motion operation PANDORA to study the health and psychological effects of low intensity microwaves with regard to the so-called "Moscow signal." 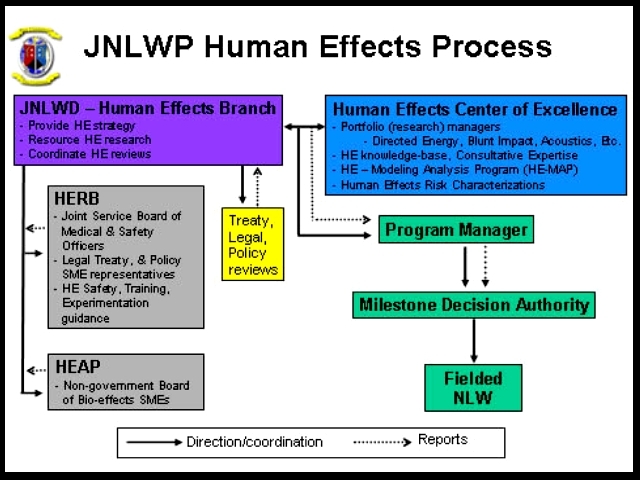 This project appears to have been quite extensive and included (under U.S. Navy funding) studies demonstrating how to induce heart seizures, create leaks in the blood/brain barrier and production of auditory hallucinations. Despite attempts to render the Pandora program invisible to scrutiny, FOIA filings revealed memoranda of Richard Cesaro, Director of DARPA, which confirmed that the program's initial goal was to "discover whether a carefully controlled microwave signal could control the mind." Cesaro urged that these studies be made "for potential weapons applications" (12). Following immense public outcry, Congress forbade further research and demanded that these projects be terminated across the board. But as former CIA agent Victor Marchetti later revealed, the programs merely became more covert with a high element of "deniability" built in to them, and that CIA claims to the contrary are a cover story. (13) Despite the fact that many of the aforementioned projects revolved around the use of narcotics and hallucinogens, projects ARTICHOKE, PANDORA and CHATTER clearly demonstrate that "psychoelectronics" were a high priority. Indeed, author John Marks' anonymous informant (known humorously as "Deep Trance") stated that beginning in 1963 mind control research strongly emphasized electronics. An obscure District of Columbia corporation called Wikepedia http://web.archive.org/web/20001007125740/http://www.io.com/~hambone/web/mru.html Mankind Research Unlimited (MRU) and its wholly owned subsidiary, Systems Consultants Inc. (SCI), operated a number of classified intelligence, government and Pentagon contracts, specializing in, amongst other things: "problem solving in the areas of intelligence electronic warfare, sensor technology and applications" (14). MRU's "capability and experience" is divided into four fields. These include "biophysics -- Biological Effects of Magnetic Fields," "Research in Magneto-fluid Dynamics," "Planetary Electro-Hydro-Dynamics" and "Geo-pathic Efforts on Living Organisms." The latter focuses on the induction of illness by altering the magnetic nature of the geography. Also under research were "Biocybernetics, Psychodynamic Experiments in Telepathy," "Errors in Human Perception," "Biologically Generated Fields," "Metapsychiatry and the Ultraconscious Mind" (believed to refer to experiments in telepathic mind control), "Behavioural Neuropsychiatry," "Analysis and Measurement of Human Subjective States" and "Human Unconscious Behavioural Patterns." Employing some old OSS, CIA and military intelligence officers, the company also engages the services of prominent physicians and psychologists including E. Stanton Maxey, Stanley R. Dean Berthold Eric Schwarz plus many more. MRU lists in its Company Capabilities "brain and mind control." (15) Despite vehement claims by MRU's chairman that it is not a "front organization for any branch of the United States Government..." (16) one must treat these claims with a great deal of skepticism. Part 2 - There followed an extensive hiatus in available information through the 1980's up to the present day. This initially appears to have closely paralleled Ronald Reagan's presidency and not surprisingly flowed onwards during President Bush's term of office. (17) As a result, the once user-friendly Freedom of Information Act became less accessible and more bureaucratic. Search costs soared and material that had been (or scheduled to be) de-classified was reviewed and re-classified. This phenomenon is not an unusual occurrence in the United States, and tends to shadow the outward face of Congress. Public outrage leads to a temporary liberalization, but as public memory recedes (all too quickly) the old institutionalized covert ways quickly re-engage. We thus move to more recent times. During 1989 CNN aired a program on electromagnetic weapons and showed a U.S. government document that outlined a contingency plan to use EM weapons against "terrorists." Prior to the show a DoD medical engineer sourced a story claiming that in the context of conditioning, microwaves and other modalities had regularly been used against Palestinians. In 1993, Defense News announced that the Russian government was discussing with American counterparts the transfer of technical information and equipment known as "Acoustic Psycho-correction." The Russians claimed that this device involves "the transmission of specific commands via static or white noise bands into the human subconscious without upsetting other intellectual functions." Experts said that demonstrations of this equipment have shown "encouraging" results "after exposure of less than one minute," and has produced "the ability to alter behavior on willing and unwilling subjects." The article goes on to explain that combined "software and hardware associated with the (sic) psycho-correction program could be procured for as little as U.S. $80,000." The Russians went on to observe that "World opinion is not ready for dealing appropriately with the problems coming from the possibility of direct access to the human mind." Acoustic psycho-correction dates back to the mid 1970's and can be used to "suppress riots, control dissidents, demoralize or disable opposing forces and enhance the performance of friendly special operations teams." (18) One U.S. concern in relation to this device was aired by Janet Morris of the Global Strategy Council, a Washington-based think tank established by former CIA deputy director Ray Cline. Morris noted that "Ground troops risk exposure to bone-conducting sound that cannot be offset by earplugs or other protective gear." In recent months I met with and discussed Russian research efforts, with a contact who had visited Russia earlier this year. He, in turn, met with a number of Russian scientists who are knowledgeable in this field. I have few doubts that the Defense News article cited earlier is fundamentally accurate. In his pioneering work, Dr. Ross Adey determined that emotional states and behavior can be remotely influenced merely by placing a subject in an electromagnetic field. By directing a carrier frequency to stimulate the brain and using amplitude modulation to shape the wave to mimic a desired EEG frequency, he was able to impose a 4.5 CPS theta rhythm on his subjects. Drs. Joseph Sharp and Allen Frey experimented with microwaves seeking to transmit spoken words directly into the audio cortex via a pulsed-microwave analog of the speaker's sound vibration. Indeed, Frey's work in this field, dating back to 1960, gave rise to the so called "Frey effect" which is now more commonly referred to as "microwave hearing." (19) Within the Pentagon this ability is now known as "Artificial Telepathy." (20) Adey and others have compiled an entire library of frequencies and pulsation rates which can effect the mind and nervous system (21). During the siege at the Mt. Carmel church near Waco, Texas, FBI agents discussed with Russian counterparts the use of acoustic psycho-correction on David Koresh and the Branch Davidians. It is understood that this contingency did not proceed. However, some unusual EM weapons were deployed at Waco. BBC World News and FBI film-footage in the possession of this writer show both the Russian equipment being demonstrated, as well as previously unseen noise generator and an unusual low frequency strobe array in use at Waco. Have weapons of this nature been developed and field tested? - Judging from the number of individuals and groups coming forward with complaints of harassment, the answer appears to be "yes." Kim Besley, of the Greenham Common Women's Peace Camp, has compiled a fairly extensive catalogue of effects that have resulted from low frequency signals emanating from the U.S. Greenham Common base, apparently targeted at the women protesters. These include: vertigo, retinal bleeding, burnt face (even at night), nausea, sleep disturbances, palpitations, loss of concentration, loss of memory, disorientation, severe headaches, temporary paralysis, faulty speech co-ordination, irritability and a sense of panic in non-panic situations. Identical and similar effects have been reported elsewhere and appear to be fairly common-place amongst so-called "victims." Many of these symptoms have been associated in medical literature with exposure to microwaves and especially through low intensity or non-thermal exposures. (22) These have been reviewed by Dr. Robert Becker, twice nominated for the Nobel Prize, and a specialist in EM effects. 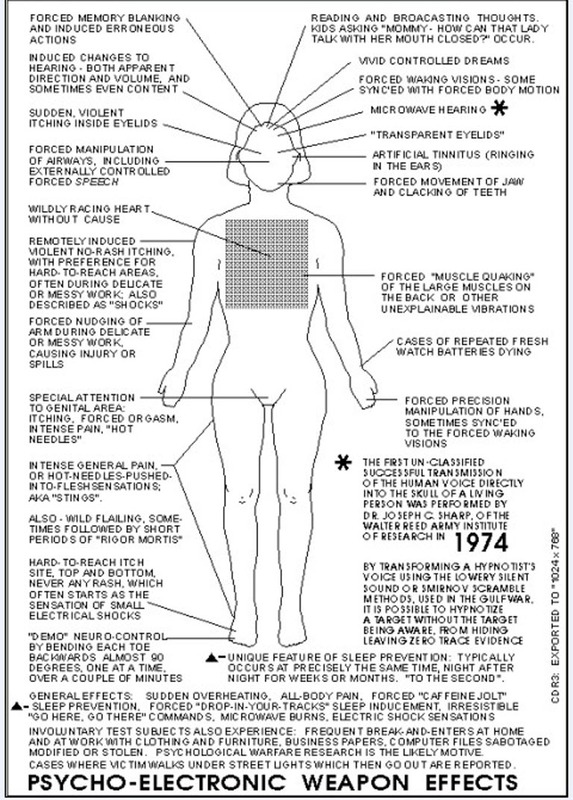 His report confirms that the symptoms mirror those he would expect to see had Microwave weapons been deployed. The April 1994 issue of Scientific American carried an article entitled "Bang! You're Alive" which briefly described some of the known arsenal of "Less Than Lethal" weapons presently available. These include laser rifles and low-frequency infrasound generators powerful enough to trigger nausea or diarrhea. Steve Aftergood of the Federation of American Scientists (FAS) noted that non-lethal weapons have been linked to "mind control" devices and that three of the most prominent advocates of non-lethality share an interest in psychic phenomena (23). Current Projects include SLEEPING BEAUTY, directed towards the battlefield use of mind-altering electromagnetic weapons. This project is headed by Jack Verona, a highly placed Defense Intelligence Agency (DIA) officer. Dr. Michael Persinger of Laurentian University is also employed on the project. Other sources have revealed a project entitled MONARCH which, supposedly, is directed towards the deliberate creation of severe multiple personality disorder (24). It is now the opinion of many that these and related programs have been brought under the banner of non-lethal weapons, otherwise known as "less than lethal," which are now promulgated in connection with the doctrine of low intensity conflict, a concept for warfare in the 21st century. It is clear that many of these Pentagon and related LTL programs operate under high classification. Others consider many similar or related "black" programs are funded from the vast resources presently available under the U.S. counter-drug law enforcement policy which has a FY 1995 budget of $13.2 billion (25). On 21 July 1994, Defense Secretary William J. Perry issued a memorandum on non-lethal weapons which outlined a tasking priority list for use of these technologies. Second on the list was "crowd control". Coming in at a poor fifth was "Disable or destroy weapons or weapon development/production processes, including suspected weapons of mass destruction." It is therefore clear that non-lethality is fundamentally seen as anti-personnel rather than anti-material. In July 1996, the Spotlight, a widely circulated right-wing U.S. newspaper, reported that well-placed DoD sources have confirmed a classified Pentagon contract for the development of "high-power electromagnetic generators that interfere with human brain waves." The article cited the memorandum of understanding dated 1994 between Attorney General Janet Reno, and Defense Secretary William Perry for transfer of LTL weapons to the law enforcement sector. A budget of under $50 million has been made available for funding associated "black" programs. Dr. Emery Horvath, a professor of physics at Harvard University, has stated in connection to the generator that interferes with human brain waves that "These electronic 'skull-zappers' are designed to invade the mind and short circuit its synapses... in the hands of government technicians, it may be used to disorient entire crowds, or to manipulate individuals into self destructive acts. It's a terrifying weapon" (26). In a 1993 U.S. Air Command and Staff College paper entitled Non Lethal Technology and Air Power, authors Maj. Jonathan W. Klaaren (USAF) and Maj. Ronald S. Mitchell (USAF) outlined selected NLT weapons. These included "Acoustic" (pulsed/attenuated high-intensity sound, infrasound (very low frequency) and Polysound (high volume, distracting) as well as high-power microwaves (HPM) that possessed the ability to deter or incapacitate human beings. These and other classified weapons are being passed to domestic law enforcement agencies, as shown by the 1995 ONDCP (Office of National Drug Control Policy) International Technology Symposium, "Counter-Drug Law Enforcement: Applied Technology for Improved Operational Effectiveness," which outlined the "Transition of advanced military technologies to the civil law enforcement environment." There are some observers who fear that the burgeoning narcotics industry is an ideal "cover" in which to "transit" Non Lethal Technologies to domestic political tasks. Whether this is merely a misplaced "Orwellian" fear remains to be seen. However, organized crime is so globally "organized" that experts now believe it is impossible to eradicate or even effectively combat (27). Part 3 - The foregoing gives some necessary background to the origins and timing surrounding the development of anti-personnel electromagnetic weapons, and in particular demonstrates that the United States has an intense and long-established interest in mind control and behavior modification that spans five decades. As we have seen, fragmentary information has surfaced for brief spells, only to disappear, once more, from public scrutiny. It remains to be said that a great many advances in the realm of electromagnetic field technology and mind control techniques have, apparently, been made during the sixties, seventies and eighties. In particular, veterans of the Vietnam war are still coming forward with bizarre stories, which collectively (if true) point to a leap in knowledge that largely remains hidden behind the thick curtain of security classification (28). Major Edward Dames, formerly with the Pentagon's Defense Intelligence Agency until 1992, was a long-serving member of the highly classified operation GRILL-FLAME, a program that focused on some of the more bizarre possibilities of intelligence gathering and remote interrogation. Known as "remote viewers," GRILL-FLAME personnel possessed a marked psychic ability that was put to use "penetrating" designated targets and gathering important intelligence on significant figures. The program operated with two teams: one working out of the top secret NSA facility at Fort George Meade in Maryland, and the other at SRI. Results are said to have been exemplary. Following the Oliver North debacle, the Secretary of Defense officially terminated GRILL-FLAME, fearing bad publicity if the program were to become known to the public. The leading members of the project -- including Dames -- immediately relocated to the privately owned and newly formed Psi-Tech, and continue their work to this day, operating under government contract. In the course of his work, Dames was (and remains) close to many the leading figures and proponents anti-personnel electromagnetic weapons, especially those that operate in the neurological field. During NBC's "The Other Side" program, Dames stated that "The U.S. Government has an electronic device which could implant thoughts in people." He refused to comment further. The program was broadcast during April 1995. This overview is merely a fragmentary glimpse of programs that have been, and continue to be, blanketed under tight security classification. Where information was available through FOIA filings, a great deal of additional information (in fact the greatest bulk) was deliberately destroyed or otherwise lost. However, this writer considers that what is available is sufficient to draw the conclusion that ongoing research, development and deployment of EM weapon systems that impact on the biological functions of the body, or more importantly, interfere with the human mind, are cause for the greatest humanitarian concern. In an age where the threat of global warfare has diminished as a result of the easing of tension between east and west, it can be anticipated that some form of introspection will occur in the developed western nations. Societies that have been generationally and economically honed for warfare do not, on the whole, assume "for peace" production with such vigor and ability. Why this is so is not the subject of this paper. Unable to so readily project the "shadow" outwards onto another nation, the enemy without soon distills to become the enemy within. (29) In the United States, (30) for example, there is a rapidly developing trend of co-operation between the military and law enforcement agencies in LTL weaponry. While it is clear that this is driven to some extent by budgetary considerations, there remain legitimate concerns regarding the long-term effects on democracy. The reality of a burgeoning and increasingly impoverished lower class that results from "swords to shears" economics, is certain to result in growing civil unrest, disobedience, strife, inner city turmoil and quite possibly much worse. (31) Rather than seeking to resolve the underlying causes of these tensions, it is feared that governments will instead resort to more durable measures to quell domestic dissent. Western industrial nations are especially prone to these developments for a variety of reasons (32). 1) Footnote 35. Noam Chomsky, in correspondence with this writer, advises that: "...we don't really 'argue that democracy has already been replaced.' Rather, that its functioning depends on an authentic free press, and that it exists only in part. That there is a one-party state -- in the sense that there are only factions of 'the business party' is not our idea; C. Wright Mills, among others, going way back." 2) Chomsky also refers to my caveat about the Spotlight article (see footnote 26) concerning the comments ascribed to Dr. Horvath and observers that "It's not the kind of comment that a Harvard physicist would be likely to make." It's such an glaring observation that I wonder why I hadn't thought of it myself. I still haven't heard back from Dr. Horvath, if indeed such a person exists. This citation, therefore, needs to be taken with even greater care. On the other hand, Dr. Steve Aftergood of the Federation of American Scientists has now written to me advising: "Spotlight is, to my mind, a thoroughly non-credible source (as you suggest). Without being able to verify the rest of the article, however, the quotation ascribed to me was accurate." 3) In a lengthy telephone call, British researcher Armen Victorian pointed out a number of relevant and interesting facts: A) Maj. General Stubblebine is no longer with Psi-Tech -- he was removed in a "palace coup" engineered, Armen says, by Major Ed. Dames and Col. John Alexander. B) In addition to his (DoD backed) Ad Hoc advisory role on Non Lethality for NATO, Alexander has now moved to head up multi-millionaire R. Bigelow's new Nevada-based National Institute for Discovery Science (NIDS). Bigelow is recruiting "top draw" personnel to study fringe science subjects including Remote Viewing, UFO's, etc. Jacques Vallee, the renowned French-born UFO researcher, is also part of the team. Armen will have a more in-depth article on these matters published in a forthcoming issue of Robin Ramsay's LOBSTER. 4) Project Monarch: Martin Cannon has more recently written stating that he believes this project to be fabricated. 18) In connection with "enhancing abilities of friendly forces" see numerous articles and expose's on Col. John B. Alexander. Alexander, a former Commander of Green Berets special forces was a member of the U.S. "Phoenix" assassination program in Vietnam. Until recently he was Director of non-lethal programs at Los Alamos National Laboratory, but has since resigned following, it is believed, an undue amount of negative press. He remains NATO's adviser on NLD. Alexander wrote a book an article (and later co-authored a book entitled The Warrior's Edge) published in Military Review in which he outlined a number of hitherto "fringe" subjects -- including telepathy -- that should be brought in to the battery of future weapons. Alexander is dedicated to the development of a super-human soldier with enhanced abilities leading to an "invincible warrior." In his book he likens such a soldier to be a JEDI KNIGHT, from the film Star Wars (Project Jedi). He has powerful sponsors, including Vice President Al Gore. Alexander is cited as being the grand daddy of NLD. He is known to be heavily engaged in mind control and psychotronic projects. See Armen Victorian, "Psychic Warfare and Non lethal Weapons."